An interesting and thought-provoking book in the arena of both the modernist disdain for the reliability of the biblical texts as a source for doing history, and the postmodern skepticism to the possibility of reaching/revisiting the past. For many people, the first chapters seem quite long and tedious (just like reading N. T. Wright's "The NT and the People of God"). They are, however, the whole apologetic argument for the possibility of history that most conservatives are not developing. The value in the work of Provan, Long and Longman, in my view, lies in their deep defence of the possibility of doing history based on testimony (here, they depend a lot on the philosophical work of Coady).There is a negative point, that is the arbitrary initial point in Abraham, with the assumption that what comes before it cannot be accessed as a historical testimony. Somehow, it feels that the authors repeated the criticized attitude of Soggin and Miller/Hayes.I highly recommend it. Once the book actually starts reviewing the Biblical History of Israel, I found it a lot more interesting. The first 155 pages focus on justifying why historians should use the Biblical testimony when dissecting Israel's history. While I understand that that is a very important subject and the assault from skeptics on the text has been heavy, just one chapter (instead of three 50 + page chapters) may have been sufficient. Other than that this an essential book for the student of the Bible to put the history of Israel in proper context. 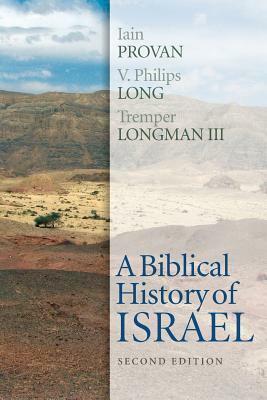 A Biblical History of Israel by Iain Provan, V. Philips Long, and Tremper Longman III has been a useful and well-respected textbook for over a decade. It has been received with both praise and criticism for its unapologetic approach in the reconstruction of Israel by scholars and students alike, but the former has always seemed outweighed the latter. Now, significantly revised and updated, this second edition of A Biblical History of Israel proves to be more refined and useful than ever. If the reader is familiar with the previous edition of the book, the content, and organization of this second edition is largely the same as before. In part one, the authors provide a helpful review of the various scholarly approaches to the historiography of ancient Israel and argue against the minimalist consensus that seeks to negate the use of the Bible as a primary source for such task. This section constructs a needed framework for the conversation and provides the reader with a useful introduction to the issues surrounding historiography and ancient Israel. In part two, the authors shape a history of ancient Israel from the time of Abraham to the Persian Period (2000 to 400 BCE) by integrating biblical sources, extrabiblical sources, and a number of relevant archaeological discoveries. In regards to the latter, the second edition has been thoroughly updated to concur with the most recent archaeological data and discoveries over the past decade, as well as new references have been added and updated. This section has and continues to be a helpful reference for the reader. It is well-documented throughout, clearly stated, convincingly argued, and judiciously presented. Additionally, in this second edition of the book, the authors have intentionally sought to address a large array of criticism against the effort of the first edition. This interaction is witnessed throughout the book and makes for a more engaging read that is certain be enjoyed by readers of all persuasions. The authors have also included a designated appendix that is aimed more specifically at the criticism against the first edition, and the attentive reader is sure to find this level of interaction helpful. In total, there is approximately 60 pages of additional material, as well as the inclusion of a number of maps and charts for the reader’s use. A Biblical History of Israel has been a useful and respected resource since first being published in 2003. This second edition has been clearly built upon a solid foundation. As expected, much of the content and organization that made the first edition successful has remained, but with this second edition, the reader has been provided a thoroughly revised, updated, and refined engagement with issues related to the history of ancient Israel. Add the intentional effort of the authors to interact with the criticism of the first edition and you have a recipe for a must-have and up-to-date volume for biblical studies enthusiasts everywhere. I received a review copy of these books in exchange for and honest review. I was not required to write a positive review. The opinions I have expressed are my own. I am disclosing this in accordance with the Federal Trade Commission’s 16 CFR, Part 255: “Guides Concerning the Use of Endorsements and Testimonials in Advertising. I read a biblical history of Israel, in exchange for review from Edelweiss. The book was written by Iain Provan, V. Phillips Long, and Tremper Longman III. The book was published by Westminster John Knox Press. I chose this book because I read Israel at War for review and was confused. A lot of the information mentioned was new to me. I chose this book because it discusses the history of Israel versus the wars between Israel and other Arabian countries. The book is written from an academic, research perspective. You really have to read it carefully to understand the book--otherwise, you will miss something. This is not a quick, easy read. This book is meant to be studied. I'm of two minds. I liked their work with the theory of how to write history (pushing back against supposedly scientific methods.) But I was a bit disappointed with the actual history. I was hoping to really get a nice picture that put the puzzle pieces together for me. Instead, it was so engaged with the nature of history that the history itself didn't really come to life. For many, the book will be worth reading for the theory alone. But for those that just want the history to come alive this book probably isn't what you want. Four hundred pages. Ðe last hundred are endnotes, very informative & intereſtiŋ ones; ðe firſt hundred or ſo, an extenſive diſcußion on ðe hiſtoriography of ðe Hiſtory of Biblical Iſrael; ðe core two hundred is a very intereſting Hiſtory of Biblical Iſrael wiþ a keen eye on critical (& oðerwiſe) hiſtoriography. A dense, academic volume that surveys ancient Israel's history while dealing with historiography issues throughout. This book demonstrates the historical reliability of the Bible through a careful reading of the Scripture as well as extra-biblical historical sources.An updated edition is now available. Modern histories of Israel refuse to use the Bible. Provan rejects this modern notion and grounds the history of Israel in the Scriptures with a careful reading of the text along with a careful consideration of archeology and extra-biblical resources. Not the most gripping, but well-written. Robust defense of the Bible's historical testimony in light of today's scholarly (unfounded) skepticism. Probably the most balanced history of Israel I've read yet. Sound, logical, fair, but most of all inspiring. An in-depth evangelical look at the historiography issues that many of today's scholars use to argue the fallibility and errancy of scripture. Iain W. Provan V. Philips Long - Marshall Sheppard Professor ofBiblical Studies (OT) at Regent College (Vancouver) and formerly senior lecturer in Hebrew and Old Testament Studies at the University of Edinburgh.